As we say goodbye to Down syndrome Awareness Month, I'd like to personally thank all those who participated and helped us with our efforts! 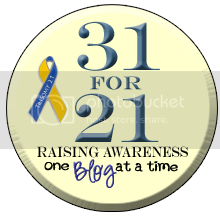 We managed to finish strong on the 21 for 31 blog challenge and we had so many great photos! While sharing stories and pictures was fun, we also started on a mission of greater importance: spreading awareness of health disparities within our own community. Thanks to Global Down Syndrome Foundation's national spokesperson, Beverly Johnson, the huge difference in life expectancy for people of color who have Down syndrome and Caucasian people with Ds was reported in mainstream media. "There's a remarkable disparity between children of color who get Down syndrome — life expectancy is age 23 — and non-black children with Down syndrome — life expectancy is 63 years old,"
We are so grateful that someone with her star power spoke out on this issue. In response, we created a petition to try to get advocates and families to help us ask the national Down syndrome groups to spend more time and resources on this issue. Within days, we heard from 3 of the 4 groups petitioned, and we've started a dialogue around this issue. You may immediately think of some negative habits. Things no one is proud of or are downright rude. Like, biting fingernails, cutting people off mid-sentence, or checking our phones ad nauseam? The thing is, I bet that you have some pretty great habits as well. Like, kissing your significant other when you leave in the morning, brushing your teeth at least twice a day, and putting your car keys in the same place when you get home. These are all simple and good habits. Habits are our behavioral autopilot. If you are unsatisfied with the state of your overall health, it is often a result of your habits, or at least can be improved with new habits. It is important to understand that your old habits don’t make you a bad person, but still realize that in order to achieve your wellness goals, old habits must change. After all, it’s those very habits got us into this mess, or are keeping us from improving.